Sky today unveils Sky Q, the next-generation home entertainment system, opening up a whole new way of watching TV. After launch in early 2016, Sky Q will keep getting better with a stream of new features and innovations, including more of the best apps and web video. In addition, Sky Q will be Ultra HD ready in advance of the launch of the UK’s most comprehensive Ultra High Definition service later in 2016. The new service will offer customers a range of sports, movies, and entertainment content in stunning picture quality with up to four times the detail of HD. Sky Q creates a seamless, effortless TV viewing experience, which Sky calls ‘Fluid Viewing’. 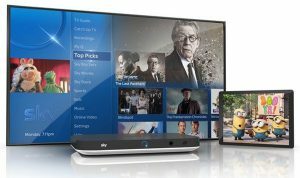 With Sky Q, it is easier than ever to watch your favourite TV, whether live channels, recordings or on demand, in any room, with the new wireless Sky Q mini box or with the Sky Q app on your tablet. Key benefits of ‘Fluid Viewing’ include the flexibility to pause what you’re viewing on your TV screen and pick up in another room on a TV or tablet. And for the first time we’re bringing the number one requested feature from customers, so you can take your recordings with you wherever you are. 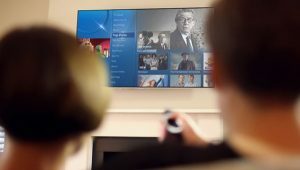 You can watch different programmes simultaneously on up to five screens around the home while recording four other channels – a first in the UK and Ireland. The new Sky Q hub supercharges your Sky Broadband by turning all your Sky Q boxes into Wi-Fi hotspots for a stronger signal and better coverage throughout the home. And, in addition to a state-of-the-art, in-home wireless network, your Sky Q boxes can connect over your home’s electric wiring to give you the best connection available. With a completely new TV guide and home page, Sky Q reinvents how you find and watch the TV you love. A new touchpad remote lets you effortlessly scroll and swipe to choose what to watch, with the help of cover art so you can instantly recognise your favourite shows. The new guide provides a great combination of recommendations – a curated Top Picks selection on the home page, alongside personalised options found in the new My Q section which are based on what you have watched at different times of day. My Q lets you pause what you’re watching in one room and carry on in another on a TV or tablet. It also lets you easily find and watch the next episode of a series. In addition, Sky Q’s powerful new search capability brings together live, recorded and on demand content in one place. It shows you everything related to a show you have searched for – whether from live channels, recordings or on demand – and will suggest similar shows that you may like to try. 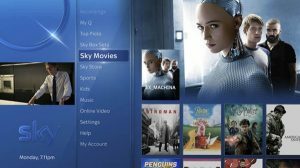 On top of Sky’s unrivalled range of the best TV and movies from around the world, Sky Q opens up access to an even wider range of content. Customers will be able to browse their Facebook photos and stream music wirelessly over their TV sound system with Bluetooth or Apple’s AirPlay. And they can catch up with the latest news and sport through interactive sidebar apps which are seamlessly integrated into the viewing experience. Sky Q will also allow you to watch your favourite videos from YouTube, watch on demand music videos from the new Vevo app and stream the best of the web to any TV connected to Sky Q or Sky Q Mini. Initial streaming partners announced today include Condé Nast Entertainment including GQ, Vanity Fair, Vogue and WIRED, GoPro, Jukin Media, Kin Community, Red Bull Media House and Whistle Sports with even more content creators to be added. After launch, Sky Q will keep getting better for customers with the launch of Ultra High Definition later in 2016 and a pipeline of other innovative new features. To make searching for programmes even easier, Sky Q will add a powerful voice search capability. In addition, the ‘Fluid Viewing’ experience will come to even more screens with a new app for smartphones, with other devices to follow. Sky Q will be available in the UK and Ireland in early 2016, with pricing to be announced closer to launch. It will join Sky’s existing line-up of TV products including the UK’s most popular PVR, Sky+, and the online streaming service, NOW TV.